Coral Calcium Daily is below-sea (often called marine grade) coral calcium that was promoted via infomercial by Robert Barefoot and Kevin Trudeau. With many companies selling Coral Calcium Daily it is very difficult to know which one is actually the main distributor. 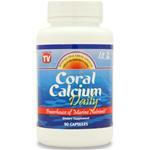 Coral Calcium Daily is an Okinawan coral calcium that contains a blend of minerals and vitamins. Distributors of Coral Calcium Daily also claim that this brand has the perfect biological ratio 2:1 of calcium to magnesium. Although it is common in marketing literature, we cannot find scientific evidence to support the 2:1 ratio theory.